Editor’s note: Our latest blog series is called “Engage With KidWorks.” We’re excited to share the variety of meaningful—and fun—ways you can become part of the KidWorks experience. In our fourth installment, we invite you to volunteer with one of our exciting programs and/or help with an event or development. Our valued KidWorks volunteers know first-hand the joy they feel when they step into one of our four centers and are greeted with enthusiasm by our students in grades preschool through high school. Our students can’t wait to tell our volunteers all about their day and to say “thank you” for the “A” they earned on yesterday’s math assignment because of the tutoring help they received. Spend individualized time with one or two students helping them in specific areas such as math, reading, and language development at one of our four learning centers. Share a special talent and passion with our students by leading them in a fun, energetic, hands-on workshop. Workshops can focus on art, science, music, dance, creative writing, etc. Assist the little ones in our licensed preschool facility helping our teachers with the preschool daily activities and lessons. Share your important skill set with us through administrative, graphic design, party planning, marketing, IT, and other types of support. Help us raise financial resources and in-kind donations critical to support the life-transforming work that we do. In-kind donations may include professional services such as advertising, design, printing and more. Interested in learning more? Please call 714.834.9400 or email volunteer@kidworksonline.org for more information and to sign up to volunteer! Editor’s note: Our latest blog series is called “Engage With KidWorks.” We’re excited to share the variety of meaningful—and fun—ways you can become part of the KidWorks experience. In our second installment, we invite you to attend one of our exciting and uplifting KidWorks events. KidWorks isn't only about homework. We also like to have fun! That’s why we’re delighted to invite you to one of the many events we hold each year to raise funds, engage with the central Santa Ana Community and enjoy our students’ many talents. Whether you’re a scratch golfer or simply appreciate the chance to play a premier course, KidWorks invites you to make your reservation now for our fifth annual KidWorks Classic Golf Tournament, to be held Thursday, May 18 at the beautiful Pelican Hill Golf Course in Newport Beach. For more information, please contact Lisa Gels, Manager of Partnerships & Donor Relations: phone: (714) 619-7560 or email: lisa.gels@kidworksoc.org. We invite you to attend our annual luncheon, that for the past three years, the Orange County Business Journal has listed as one of the top five fundraising luncheons. For each of its 10 years, the event has featured an extraordinary keynote speaker. It’s also instrumental in helping us raise a substantial portion of the funds for our after-school programs. This year’s event details are coming soon! Wednesday, March 22, 7:00 p.m.: Concert event at Super Antojitos restaurant in Tustin. The event will feature a short five-song set with students in KidWorks Avanti musical program. There will also be a set with Avanti founder and professional musician, Joe Cristina and guitarist/vocalist Tiago Costa. There is no cover charge. Sunday, April 30, 3 p.m. St. Andrews Presbyterian Church in Newport Beach: “Imago Dei” concert hosted by Jenny Park. This event will feature students from Jenny’s music academy, other local musical groups and selected Avanti students. The concert is free. Editor’s note: Our latest blog series is called “Engage With KidWorks.” We’re excited to share the variety of meaningful—and fun—ways you can become part of the KidWorks experience. In our first installment, we share research that shows how monetary donations to non-profits like KidWorks not only make a sustained meaningful impact—they also make us feel better as people! In the words of those researcher: "Happier people give more and giving makes people happier, such that happiness and giving may operate in a positive feedback loop." Our KidWorks supporters are among the most generous people we know. So, if giving equates to happiness, maybe that’s why our volunteers and contributors have such positive outlooks on life. Need a lift today? Consider making a donation to your friends at KidWorks! Our KidWorks Preschool students had a very special President’s Day. Over 40 of our kids spent the day at the La Habra Children’s Museum. We are so greatful to Kevin Watson, owner of JFK Transportation, for so generously donating the transportation for our fun day at the museum. There were about 6 rooms to explore in the museum. The children had an amazing time exploring a room with a variety of animal fossils, “you could tell they were amazed to see the following a lion, a grizzly bear, and a hyena, which was perfect since we just learned about hibernation in class,” said Idalia Galdamez, KidWorks Preschool Director. Following the animal fossils, students explored a room with a grand theater and saw different costumes from fireman gear to singers and ballerinas. Next, students visited a room that had a market and an old OCTA bus. Students were more than glad to pretend to be bus drivers. Lastly, there was a room decorated like the Old Stone Age. Students were able to pretend to live in that era. Some of them got to climb on top of mammoths, wear pretend skin clothes, and many of our kids took pictures. We had the best day! Thank you, La Habra Children’s Museum. Sometimes, a fresh apple and half a ham sandwich are exactly the enticements a first grader needs to warm up to our after school programs. Not too long ago, that simple act of hospitality was how Brizzy Cruz, Site Director at our Bishop Manor Center, convinced little Amariis and her mom, Jenny Heng, to give KidWorks after school programs a try. Like all of our centers, Bishop Manor is intentionally located in an underserved central Santa Ana neighborhood. This schoolroom opened five years ago, and Brizzy has been the center’s leader for two years. As soon as she arrives at the center, the warmth between she and her students is evident. “Ms. Brizzy! Ms. Brizzy!” they call out enthusiastically, as the schoolroom fills with students plopping down backpacks and pulling out their homework. Brizzy takes a vibrant, creative approach to teaching. For example, instead of just reciting the four seasons of the year, Brizzy encourages them draw pictures of the seasons, describe them and spell them correctly. Brizzy joined KidWorks as a volunteer in 2006 and joined the staff one year later. For Brizzy, the classroom is just one way to form a strong relationship with her students and their families. Outside of her KidWorks’ duties, Brizzy loves all forms of dance, plays volleyball and is an avid reader. In October 2015 she married Victor, an electrical technician with the Los Angeles Unified School District. Brizzy, thank you for the many years you have made every one of your students feel special as you help each live up to his or her full potential! Editor’s note: In the fourth story in our “The Teachers” blog series, we celebrate Dianna Valdez, Site Director of our Cedar Evergreen Center. Dianna Valdez stands in front of her small classroom filled with about a dozen first and second graders. She has a question for them as they work through snacks consisting of half a sandwich, an apple, baby carrots, yoghurt and milk. “What is the opposite of ‘first’?” she asks. “Second?” one student tentatively volunteers. “Not exactly,” Dianna gently answers. “Last!” first grader Adrian says confidently. “That’s correct,” Dianna says, handing him a sticker that he proudly affixes next to the others on his yellow homework folder. If Dianna seems like a natural-born teacher, it’s probably because she’s been at it awhile—since she was seven years old, in fact! Dianna has been a valued member of the KidWorks team for three years, and has led our Cedar Evergreen Center since it opened. From its humble beginnings where only a handful of students attended after school programs, Cedar Evergreen now serves 55 students in grades kindergarten through 12. She thanks Art Quiroz, Program Leader at Cedar Evergreen, for helping her make the center such a vital part of the surrounding community. Dianna grew up in Santa Ana and she has a heart for the underserved. She knows firsthand what it’s like for a family to struggle. Dianna, along with her four brothers, was raised by a single mother who worked three jobs to support them. Dianna also says her personal teaching style evolved from her own experiences as a youngster in elementary school. Her own approach is the opposite; it’s to involve each and every student. A recent example of Dianna’s caring heart was when she noticed a kindergarten boy had not shown up to class for over a week. The little boy fully recovered and happily returned to the Cedar Evergreen Center as soon as he was able. Outside of her teaching duties, Dianna enjoys hiking and is and perhaps the biggest Disneyland fan you’ll ever meet. “I go to the park about a dozen times a year,” she confesses. Thunder Mountain is her favorite attraction. Dianna is also a person of deep Christian faith, and very active in her church, Templo Calvario in Santa Ana, where she serves as Assistant Director of Youth. Dianna, thanks for sharing your deep passion for teaching with every student under your care, and for seeing him or her as individuals with limitless potential. On a chilly, mid-January afternoon, Karina Flores leads a group of about two dozen elementary school students on a short walk to Jerome Park in central Santa Ana. They’ve earned a 20-minute break from their after-school homework lessons at our Townsend Street Center. “OK, Ms. Karina,” they chime in unison. Karina has a special bond with her students. She grew up on Townsend Street where this KidWorks satellite center is located and knows first-hand the struggles and challenges of an underserved neighborhood. In fact before she joined our staff, Karina was a KidWorks student herself, attending our programs from sixth grade all the way through high school. She was a member of the first-ever group of students who comprised Community Leaders of Santa Ana (CLOSA), our youth-led organization that helps improve the surrounding neighborhood with cleanups, sponsored events and other activities. “I want each student to know that whatever hardships they and their families are going through, that the KidWorks center is a place that for 90 minutes each day they have a safe, encouraging place to go,” she says. As she leads her class, Karina’s gentle, quiet personality shines through—and so does her strength. Recently, a second grader approached her in class and asked if he could color with crayons. “Yes, but only after you read for 10 minutes,” Karina said. “How about after five minutes?” the boy said, smiling playfully. 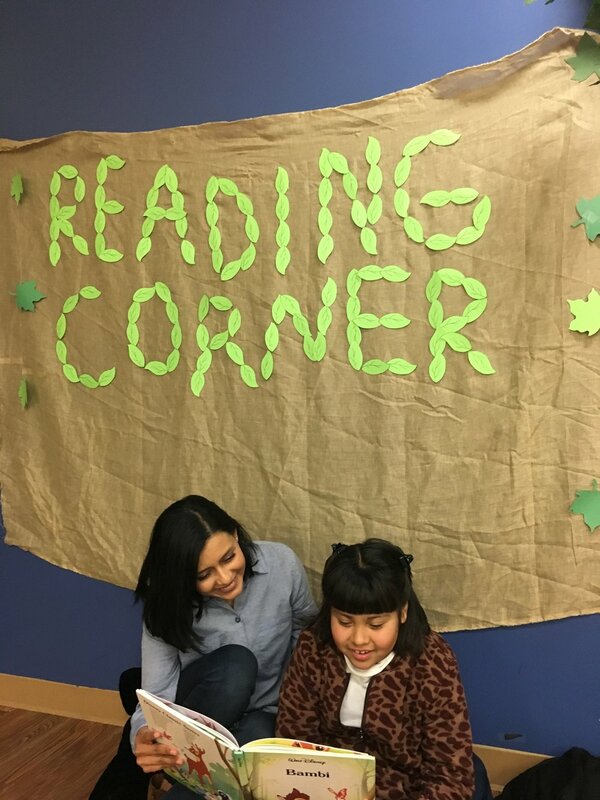 Jocelyn is one of Karina’s seventh grade students who is so inspired by her teacher that she also volunteers several hours, four days a week at the Townsend Center. Outside of work, Karina and Jose Ayala, the Health & Fitness Program Coordinator at our main Dan Donahue Center, are busy planning a June wedding. They enjoy hiking and camping together, and have visited the Grand Canyon, Sequoia National Forest and Yosemite. She also enjoys action and romance movies. Karina, everyone at KidWorks is so proud of the way you have grown from a diligent student in our programs into a site coordinator and role model for other children and youth as you mold them into equally contributing members of the community. Thank you! Isaac Michaca is a young man with both vision and passion for Santa Ana, a city he clearly loves. In fact, this KidWorks student and Santa Ana College freshman is so committed to Santa Ana and its residents that he hopes one day to serve as mayor. Before that happens, Isaac realizes that it’s “first things-first.” In that regard, he’s just accepted an appointment as the only youth named to serve a one-year term on the City of Santa Ana’s General Planning Committee. It’s a significant role that Isaac takes seriously. “I especially want to be a champion for health and nutrition, urban agriculture, cultural knowledge and restorative justice,” Isaac says. Those are the same areas of focus he’s had since joining KidWorks’ Youth Empowerment Network (YEN) in 2012. He now serves as a coordinator with the group. YEN is a youth-initiated and youth-led program that develops, designs and address issues that impact youth, their families and their neighborhoods. One of YEN’s focus areas is one that Isaac plans to be a champion for on the City of Santa Ana General Planning Committee. “Community composting and community garden programs, like the ones we have at KidWorks, will help promote healthy eating, combat obesity and help prevent diabetes,” Isaac says. Isaac expresses his thanks to those who have helped him along the way. “I have been blessed by the KidWorks staff, my fellow students and volunteers who have helped me to grow into a leader,” he says. Raquel Nava’s eyes brim with tears when she speaks about her own childhood—and how those difficult years fill her with empathy for the students she works with each day at KidWorks. Raquel was sent to California from Mexico to live with an aunt when she was just six years old. Her parents have never really been a part of her life. In elementary school and high school, Raquel’s heart grew softer instead of harder when other students poked fun at her because she didn’t fully understand the culture, speak fluent English or wear newer clothes. But Raquel learned perseverance and goal setting that led to her earning both a bachelor’s and master’s degree. She paid for her education herself, working three jobs at once. Raquel has been with KidWorks for nearly two years. And she’s one of our students’ favorites. “At one point, I was pursuing a career in film production, but eventually I realized that in my heart my real desire was to help the underserved, especially those in Santa Ana where I grew up,” Raquel says. KidWorks has proved to be an ideal match with Raquel’s natural teaching gifts and her empathetic nature. Having been a resilient self-starter, Raquel now instills the same skills in the second, fifth and eighth graders she teaches. Raquel is a huge believer in positive reinforcement. Raquel and her husband, Everardo, a certified public accountant, lead busy lives. Everardo regularly volunteers at our after school programs. They both enjoy cooking (pozole, a traditional Mexican stew is one of Raquel’s specialties), yoga and bingo. Raquel, thank you for being such a shining star and fully sharing your caring heart with all of KidWorks students. Our KidWorks teachers mean the world to us. They work so hard to provide our students with support, encouragement, and the tools they need to succeed. Our teachers are developing community leaders and agents of change in central Santa Ana. Teacher, Rachel Cervantes, is no exception. Her commitment to her students goes unmatched. It’s a fact: In any school, some students struggle a little bit more than others. That’s where the compassion of KidWorks teachers and volunteers really kicks into high gear. Our mission is for every student to perform at his or her full potential. Recently, Rachel Cervantes, a Program Leader at our Dan Donahue Center, helped a fourth grade boy overcome some behavioral issues and gain confidence. Yet, by working with Eduardo and his mom, a corner was soon turned. She also thanks Jessica Ellis, Site Director, Dan Donahue Center, for her guidance. Jessica suggested ways to involve Eduardo and his mom in monitoring his behavior both at home and at our center. It’s helped point Eduardo in the right direction. “I am thankful for Jessica’s guidance, instruction and for her heart for the kids,” Rachel says. We are proud of students like Eduardo, and forever grateful to teachers like Rachel and all our volunteers who make a permanent positive difference in the lives of those we serve. With just hours left before we welcome 2017, KidWorks has a wonderful idea about how to finish 2016 on the right note. Please considering saying “goodbye 2016” and “hello 2017” by making a donation to KidWorks. We are so grateful for every dollar that helps us serve hundreds of children, youth and parents in central Santa Ana. In just 10 short days, we’ll turn the calendar page and welcome 2017. That means most of us are probably already jotting down our New Year’s resolutions. At KidWorks, we believe that volunteering should be on everyone’s list. As a KidWorks supporter, we appreciate all the ways you’ve lent a hand, and we look forward to our continued partnership in 2017. Perhaps you know of a family member or friend looking for a way to add even more meaning to his or her life by volunteering and serving others. Click Here for information on volunteering! Thank you for helping us get the word out to potential volunteers! It’s really what the holidays are all about. We share fellowship, meals and gifts to express love and appreciation for those who mean so much to us. We’d be so grateful if you could share your support for KidWorks with other family and friends. It’s a great opportunity to encourage them to consider making a contribution to KidWorks this holiday season. Happy holidays from all of us at KidWorks and on behalf of the hundreds of families we serve throughout the year! We asked our students "What are you thankful for?" and they had some great answers! Editor’s note: We’re delighted to present the third installment in our latest blog series, Giving Thanks. As everyone prepares to celebrate Thanksgiving, we feel this is the perfect time to invite KidWorks’ friends and families to share a little about what they are most thankful for. Look for another installment next week! Karen Gallardo-Cano knows exactly the blessings she’s thankful for this holiday season. In fact, they number in the dozens. No, they are not material goods. This high school sophomore and KidWorks student is most thankful for the many KidWorks staff members, volunteers and fellow students who have positively impacted her life. Karen takes her appreciation for others and applies it to her leadership position as president of Community Leaders of Santa Ana (CLOSA), our youth-led organization that helps improve the surrounding neighborhood with cleanup, sponsored events and other activities. Like a good leader, she is quick to say “thanks” to her team, including Maria Contreras, vice president, Nancy Cervantes, secretary and all the CLOSA membership. “They are amazing,” Karen says. Karen is also thankful for each of the 24 hours in a day. Without a doubt, she fits all she can into her waking hours. Karen is a member of the green environmental club at Valley High School and serves as Associated Student Body Vice President for the class of 2019. And did we mention that she also makes time to play on the school’s varsity and junior varsity water polo teams? Speaking of giving thanks, we are so grateful to Karen for being a KidWorks student for 11 years, and for the time she spends as a volunteer helping other children and youth. Now, if someone could just invent the 30-hour day, Karen would find a meaningful way to fill that time, too! Editor’s note: We’re delighted to present the second installment in our latest blog series, Giving Thanks. As everyone prepares to celebrate Thanksgiving, we feel this is the perfect time to invite KidWorks’ friends and families to share a little about what they are most thankful for. Look for another installment next week! If you ask a teacher what she’s especially thankful for, it’s not surprising that the value of education is right at the top of the list. In fact, the love of learning and teaching is a common thread that’s woven throughout Elizabeth Nilsen-Doble’s life. This KidWorks volunteer was a teacher in New York and California for four decades. Now, she generously brings that wealth of experience to us when she serves as a tutor and after school program volunteer at our Dan Donahue Center. Elizabeth is also quick to express thanks to her parents and the church. Elizabeth is also grateful for the fellowship she enjoyed at the Lutheran church in Brooklyn when she was growing up. She is now equally thankful to be part of the congregation at St. Andrews Presbyterian Church in Newport Beach. That’s where she first heard about KidWorks. “At KidWorks, I always find lots of smiling faces, and students filled with energy and a love of learning,” she says. Editor’s note: We are introducing our latest blog series, Giving Thanks. As everyone prepares to celebrate Thanksgiving, we feel this is the perfect time to invite KidWorks’ friends and families to share a little about what they are most thankful for. Look for another installment next week! Maria Villa knows instantly what fills her with gratitude and thankfulness as the holidays approach. Maria's grandmother provided her with all the love, care, and resources she needed growing up. She lovingly refers to her grandmother as the “ultimate role mode”: Always being caring, lovable and hard working. Maria and her husband, Juan Carlos, are proud parents who also readily express how grateful they are for their children. Maria sees her life and her family as a blessing from God. She expressed how thankful she is for every blessing God provides to her family each and every day. Maria has a heart of gold and we are grateful that her family is a part of KidWorks as well. And when she refers to the positive impact KidWorks has had on her life that speaks volumes. Karina joined our programs as a sixth grader and continued through her high school years. She was also a member of the first-ever group of students who comprised Community Leaders of Santa Ana (CLOSA), our youth-led organization that helps improve the surrounding neighborhood with cleanups, sponsored events and other activities. She didn’t know it at the time, but her immersion in KidWorks was the perfect preparation for her to join our staff in 2012 as an assistant within the after-school program. Since then, she’s had roles that have included assisting with KidWorks University workshops and a program leader at the Dan Donahue Center. For the past four years, Karina has also been a member of the leadership team responsible for the kindergarten through fifth grade summer program. Karina is the perfect person to take on the Site Coordinator role from Jessica Ellis, who was recently promoted to Site Director for the Dan Donahue Center. That’s because Karina had been assisting Jessica at the Townsend Center in 2014. Having grown up in Santa Ana, Karina is well suited to understanding the challenges and opportunities within the neighborhoods we serve. Outside of work, Karina has a full range of interests and hobbies. Please join us in congratulating this delightful member of the KidWorks team on her new role and in wishing Karina every success. Editor’s note: We are pleased to introduce our latest blog series, “A Closer Look: KidWorks’ Programs.” We offer a full range of programs for children, youth and adults. In this series, we focus on several of aspects, giving you a peek into what makes these programs tick—and sharing a few “little known secrets”! When a child plops his or her backpack onto the floor and begins one of our after-school sessions, we see an opportunity that goes far beyond a sheet of homework. “It’s really about the whole person,” says Noemi Juarez, KidWorks’ Director of After School Programs. That’s where our University Starts Now comes in. USN for short, this program focuses on our younger students, ranging from kindergarten through fifth grade. In addition to the all-important academics, USN also gives our kids a chance to blossom in ways that are unique to KidWorks’. Noemi gives an example from the most recent school year. We celebrate individual and class success with “spirit days” that have included popcorn and ice cream parties. It’s all meant to make learning fun. With that said, KidWorks is also all about results and academic improvement. We subscribe to several programs from “Let’s Go Learn,” a diagnostic testing service that helps us benchmark and track our students’ success. Testing takes place in October, with follow-up testing near the close of the school year.